I know summer is almost over and the kids are heading back to school but this might inspire you to think early for Christmas. When I was doing some quilt sorting the other day I came across two fabric game quilts I made years ago when my kids were in grade school. 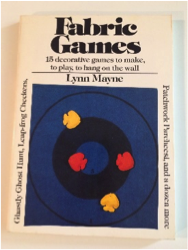 The first one came from a book called Fabric Games by Lynn Mayne (you can still find copies on Amazon!). The quilt game I made from this book was Parcheesi. If you remember, it is a game with four colors and the first one to the center wins! 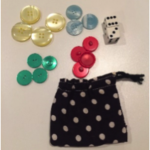 I also made a little bag to hold the dice and colored buttons (uh oh – I just noticed I am missing a blue button, better find another one in my button jar). This little game measures 32” x 32” and folds up nicely to store when you are done playing. My kids (now 37 and 39) had lots of fun playing this game. Now days it might be pretty tough to wrestle an electronic device away from your kids or grandkids but I think they would have fun playing with you and having casual conversation which can happen during game time. Who knows, you might even find out something about their world. The last one here is a Checkers game. 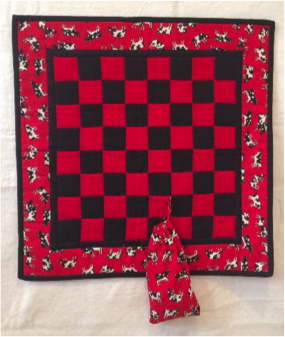 It is pretty simple to design the pattern yourself since it is just 32 red and 32 black squares (I cut them 2.25”) put together in a checkerboard pattern with a .5” finished black border and a 2” finished “cow” border. Don’t ask me why I picked That fabric! We didn’t live on a farm or anything like it but country decorating was in and it was probably the only black and red fabric I could find in the ‘80s. If you look in your closet or go to Wooden Spools I’m sure you could find something much more appropriate for today. You can see I also made a little bag to hold the checkers and put a safety pin on the ribbon so it always stays with the checkerboard. I hope you can have some fun with young people using your own homemade Fabric Games! 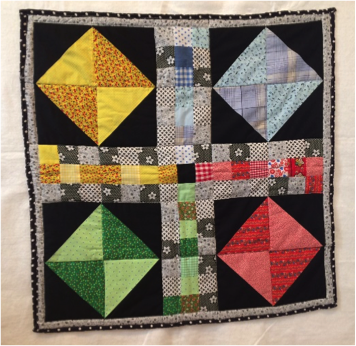 Just for you – Quilt Quote: Blessed are the Children of Piecemakers for they shall inherit the Quilts! ← “Around the World” fabric search – ends in success at Wooden Spools!